Croatian cinematic dark ambient artist Aegri Somnia delivers another post-apocalyptic gem, this time taking listeners to bold new vistas. 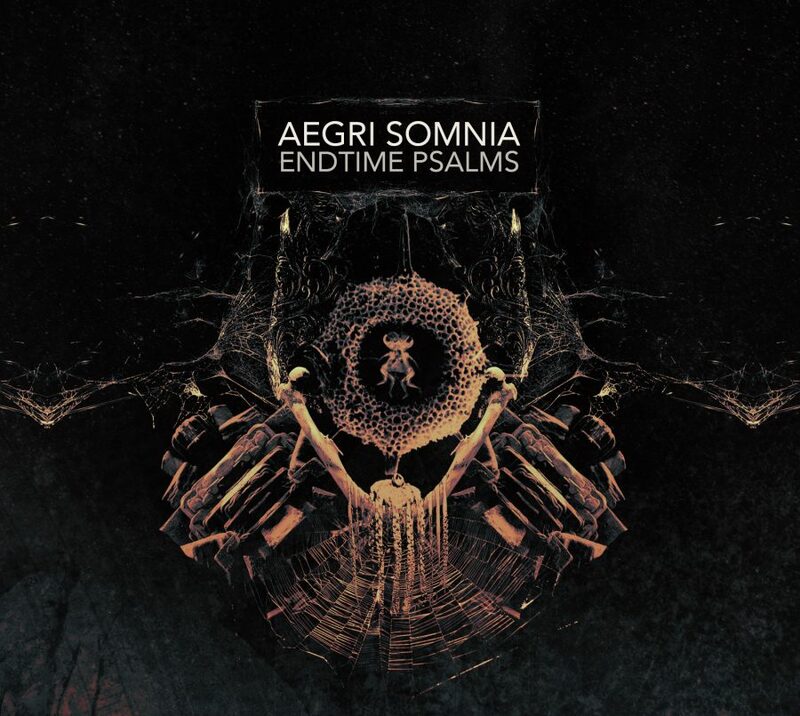 Aegria Somnia has been around in one form or another for a decade. 2007 and 2008 saw some early albums by this artist on Kaos Ex Machina Promotions and Dark Winter, respectively.In 2015, Jurica Santek revived Aegri Somnia with Monde Obscure on Cryo Chamber. Monde Obscure would be a major moment in the career of this dark ambient artist. It would bring his soundscapes to the forefront of the dark ambient genre, greatly due to it’s release on the monolithic Cryo Chamber label. Monde Obscure took listeners into the underground tunnels, basements, and fallout shelters of a dead world. Aegri Somnia is at his best when depicting a world dying or already deceased. Monde Obscure featured static landscapes, which seemed mostly devoid of life. Now, with Endtime Psalms, we find similarly decrepit and irradiated landscapes, but this time humanity is still present. Endtime Psalms is a living and breathing entity. The echoes of our civilizations still reverberate through the decaying walls. It depicts a world that is actively dying, a sentiment that is blatantly referred to in tracks like “Mundus Moriens” which literally translates to ‘dying world’. From a technical standpoint, Endtime Psalms will sound familiar to fans of Monde Obscure. Yet, there is noticeable evolution here in the soundscapes. It is worth noting that Jurica Santek has recently released several albums under his alias, Tertium Organum. It seems that project may have given some influence to Aegri Somnia. Endtime Psalms uses a good bit more drone than we heard on Monde Obscure. This doesn’t totally change the face of the project, but it does add a depth that wasn’t previously afforded. The soundscapes now have a solid foundation, a sweeping, doom-laden dronework which rarely subsided on Endtime Psalms. It is, luckily, used in a way that doesn’t overpower the cinematic elements. It mainly adds an extra layer of texture, building up the sense of smog filled atmospheres and acid rains. When, occasionally, the drones do fade away, the field recordings take on a more meaningful tone, giving the listener a cue to focus more specifically on their narrative. Within this dying world we are offered visions of its inhabitants. Fleeting images of the doomsday cults, which have come to prominence. We must imagine that these cults, years before, were laughed at, prodded and ridiculed for their depressing predictions. Yet, here in the era of Endtime Psalms, we see that the joke was on the naive. The world seems to have warmed significantly. Tracks like “Archives” and “Mundus Moriens” have a marine element that rarely fades. We are forced to accept the effects of global warming. The poles have melted, the glaciers are no more. In this new world many lands have been submerged. Humanity was forced inland. Whole nations have been submerged. Thus is the world of the Endtime Psalms. Tracks like “DNA Cults” and “Puppets” must allude to the rise to prominence of the doomsday cults. With the world set on an irreversible trajectory towards utter annihilation, these fore-tellers of doom have been given due credence. Gone are the hopes of salvation, washed away with the millions of lives that have already expired. These cults now rule the lands. Their worshipers, enshrouded in the filth of the land, listen attentively for some sense of hope. Yet, there will be no hope, all is already lost. Of course, this is just one interpretation of an album which packs enough cinematics to keep listeners’ imaginations inflamed. Each play-through conjures new landscapes in the devastation. It is certainly clear that humanity now lies in ruin, but the time-line and cultural shifts are left to the imaginings of each individual. After such an impressive product as Monde Obscure, one could wonder how Aegri Somnia would top its achievements. Jurica Santek doesn’t try to conquer his previous work, instead he moves off to the side, building a new foundation, with new stories, even if they fall within the same general narrative. Like its predecessor, Endtime Psalms is the epitome of cinematic dark ambient. Aegri Somnia is one of the best at conjuring narratives and irradiated landscapes. He affords listeners enough flexibility for their imaginations to run wild. I would absolutely recommend Endtime Psalms to any fan of the cinematic dark ambient style. The evolution of the Aegri Somnia sound has been worthwhile. There are no setbacks; no points where we could look to the past in critique of the present. This is the end of humanity, delivered neatly in the form of dark ambient. Where once we ruled supreme, now we cower in trepidation. Endtime Psalms is the soundtrack to our undoing.